The Louvre shocked the inteligensia world wide with plans to add a McDonald's to their food court within the famed museum's hallowed halls. Read the article here on the french (rightful) outrage HERE Home to the Mona Lisa- and the McRibb wow. 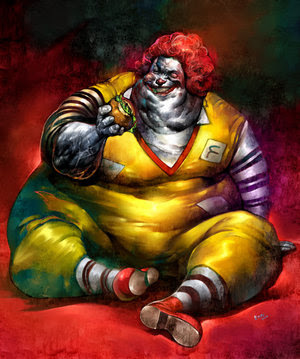 Louvre spokespersons have stated they plan to have a diverse food court and that McDonald's is a global representative of The United States of America.... Personally I died a little bit when I read the article. It's been that kind of day. Gourmet magazine got the ax after 68 years of publishing by the evil empire of Condé-Nast. The world is getting smaller, poorer, and sadly déclassé.